The doors can be locked without a key. To lock the doors, first push the inside lock switch to the "LOCK" position so that the red mark on the switch is not visible, then close the door. 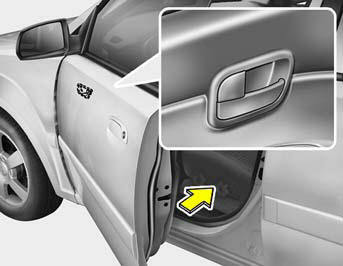 o When pushing the lock switch of the passenger's door to the "LOCK" position, all doors can be locked. o If your vehicle is equipped with the central door locking system, the door will not lock if the key is left in the ignition switch when the front doors are closed. o When locking the door from outside, be careful not to lock the door with the ignition key left in the vehicle. o To protect against theft, always remove the ignition key, close all windows, and lock all doors and the trunk lid (4 Door) / tail gate (3 Door) when leaving your vehicle unattended.